As a result of this review, Lenovo and I have spoken back and forth regarding the DRAM situation around the P300. When sampling the media for the P300 series, their goal would seem to be to show off their default Haswell Xeon workstation and gather feedback. Due to the whole reviewing procedure, we only test the one configuration that is sent to us, so conclusions about performance could plausibly be completely different if a separate configuration had ended up on the doorstep. The issue at hand is that the system, as per Lenovo’s system configurator, only gives one module of DRAM by default. 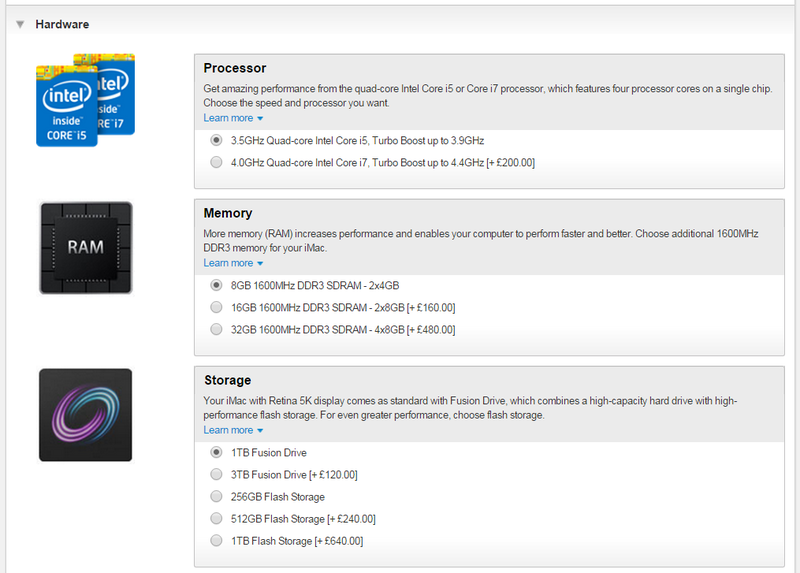 This happened to be the configuration that was sent out to the media for review. For anyone outside the technology industry, this might not sound like an issue, but for anyone that has delved into how a computer works should see this as an immediate yellow flag, especially when paired with a dual channel processor. To cut a long explanation short, a single memory module used in a system with a dual channel processor means that peak memory performance that requires a lot of memory accesses is slower than the peak potential of the processor. A dual channel processor can issue a command that reads or writes from the memory, and the system can access each memory channel independently and at the same time, thereby halving the time to read or write a big block of data. 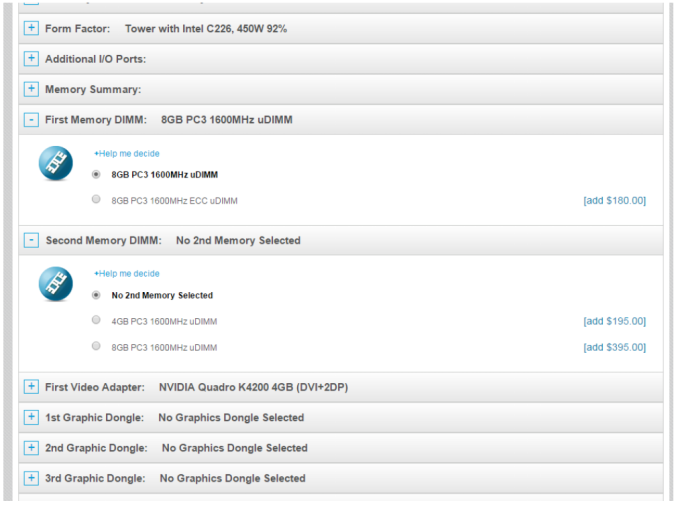 Haswell processors also support up to two memory modules per channel, which gives four DRAM slots in total. Lenovo’s initial response to my concerns was a little terse. Rather than acknowledge a potential problem with performance, it was redirected around to a potential benefit. By offering a single 8GB DRAM module by default, rather than a 2 x 4GB arrangement, users could upgrade the system to a maximum of 32GB at a later date by adding more 8GB modules. Should a user want to take advantage of dual channel operation, using two modules of the same size to keep performance optimal, it would require an extra $395 outlay. This is despite the reality that the module itself costs as little as $70 over at Newegg, making a 464% markup over retail cost. One response on this issue was that Lenovo also acts as an OEM with resellers and did not want to price compete with them. The reality for consumers is that reducing that $395 to $125 would still be a bit expensive, but more in line with what a prosumer might expect. Even if a seller wants to be able to offer a 1x8GB configuration with this system then by all means do so, but please adjust the default option to 2x4GB. This way, if a prosumer or IT department of a company want to purchase a number of systems, if they have to manually select 1x8 GB then they might actually know what they are doing performance wise. Even better would be a disclaimer on the website notifying a user of potential loss in peak performance due to the choice would be best. As I most of our readers know, here at AnandTech we do not tend to make suggestions without some hard data to back it up. To this end, we ran the P300 through our benchmark suite twice – once in the default 1x8GB configuration, and another in a 2x4GB configuration using some Kingston memory we have in from a previous review. 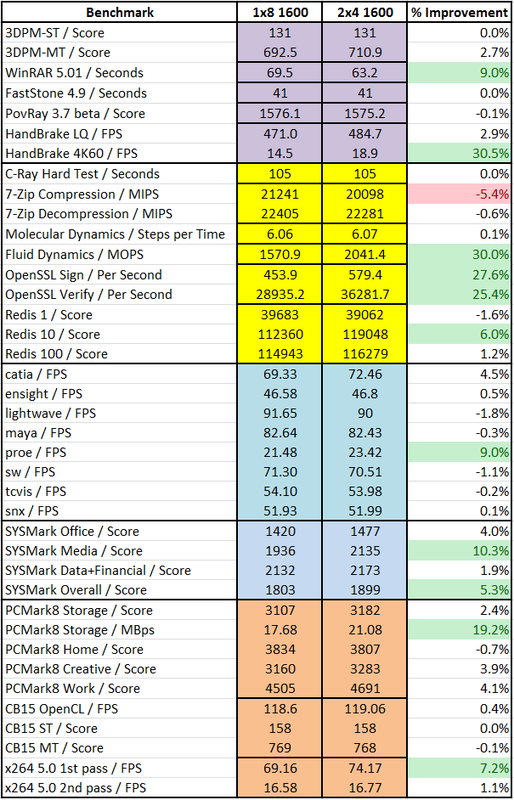 Both sets of modules were verified at the same speed (DDR3-1600 CAS 11), and the results comparison is as follows. Percentage improvements above 5% were listed in green. While it is true that not everyone will be using this sort of software, Lenovo could easily be removing a potential negative by offering a dual channel arrangement by default. Apple gives three options with their Haswell processors: 2x4GB, 2x8GB or 4x8GB. This means that Apple will only sell you an iMac in a dual channel configuration, rather than any lopsided configuration. By limiting their offering to the user base, it subsequently provides a level of performance that maximizes the potential of the system regardless of what the system is used for. Ultimately using a single module configuration might invoke a little of the Dunning-Kruger effect – if a user does not know their system is not running at its potential, there won’t be any complaints. Unfortunately this skews the reality of the situation, as I’m sure that if up to 30% extra performance were offered, they would take it – depending on the price. Offering a 2x4GB option by default is something Lenovo could do very quickly, and cost them very little in the process, although it might make them miss out on potential sales of 8GB DRAM modules at $395 each. I use lot of Samsung 850 Pros and SanDisk 960GB ExtremePro SSDs. But this Mushkin Scorpion Deluxe 960GB PCIe SSD decimates those models (PCIe 2.0 x8 interface). which does about nothing. I have one. Unless they completely redesigned how they worked in the last 3 years (which, I doubt). 1) Cached file information. Anyone dealing with video editing will appreciate this. The video info and previews load much faster than a traditional HDD due to the SSD cache. 2) Overall operating temps. Possibly because they don't need to spin up as often, my Seagate SSHD is cool to the touch while my retired WD Blacks could probably cause a burn. I agree SSHD's are great alternatives to SSD's in certain machines. But they do not belong in laptops (honestly any mobile device should have no moving parts outside of a fan...for obvious durability reasons) and they don't belong in workstations where there is space for a SSD boot drive and a HDD storage drive.